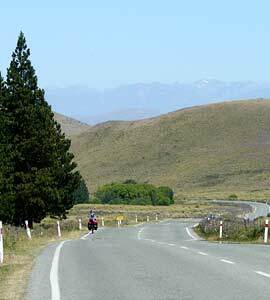 On Friday morning, January 11, we set out from Fairlie for Lake Tekapo. This was a ride we'd somewhat dreaded because it involved climbing Burke Pass, the first pass we've encountereed that actually has a name. It turned out, however, not to be terribly difficult. It was sunny and pleasant, warm enough but not brutal, and only the last kilometer or so involved real climbing. 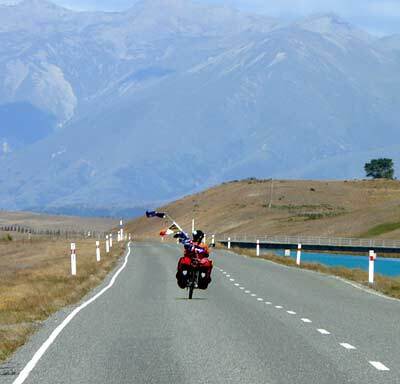 Even then it was not nearly as steep as the first kilometer out of Rakaia Gorge. This day's ride was also about 45 kilometers, but it was getting hot so we were glad to stop. 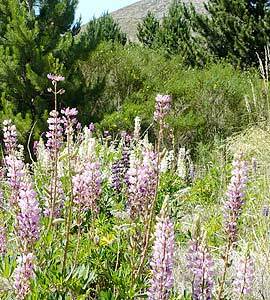 Photos below show Barbara reaching the top of Burke Pass; then high country lupins; finally heading back down the far side. 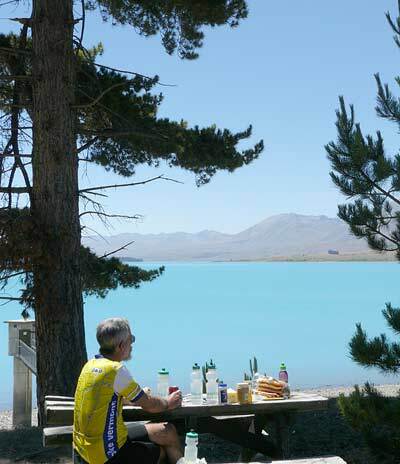 At left is a picnic spot overlooking Lake Tekapo, just a few hundred metres from the campground. 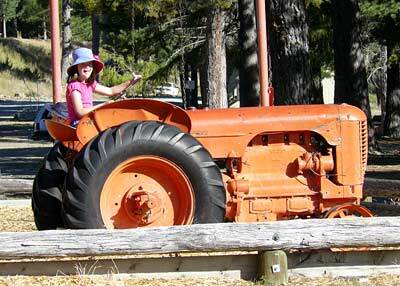 Barbara thought it was terrific that there was a tractor in the playground for children to enjoy  though it would probably be considered unsafe for an American playground! 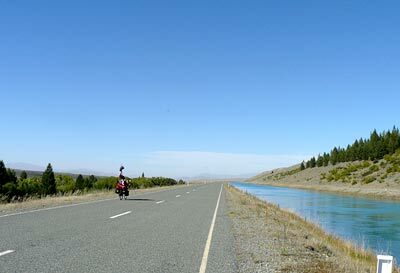 Below is another photo of Lake Tekapo taken as we rode away on Saturday morning. We will probably always remember the ride on Saturday the 12th because it was our first experience of New Zealand's notorious northwesterlies. The main road, Route 79, had a quite a lot of traffic, so we opted to ride over 30 kilometers along a paved canal road. The canal road was officially closed because it is even more exposed to the winds than the main highway. However we decided to take it anyway because we figured that it would be better to be blown into a canal than into the path of an oncoming tourist bus! On the right is the canal road at the very beginning, which was sheltered. Then the wind slammed us. Nothing that dire happened, but it was an extraordinary sensation. 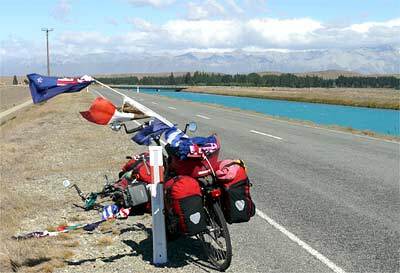 Sometimes our bikes were leaned far into the wind while our flagpoles were whipped almost horizontal. It's only a guess, but the gusts could easily have been 50 or 60 mph. For the first 20 kilometers or so we dealt with crosswinds and headwinds. The last 10 kilometers or so, at last, we had a tailwind, and we really screamed along. Although difficult, dealing with the winds was exhilirating, especially since the worst of it only lasted a couple of hours. Had we needed to fight the winds all day, we might have decided to lay down in a ditch! 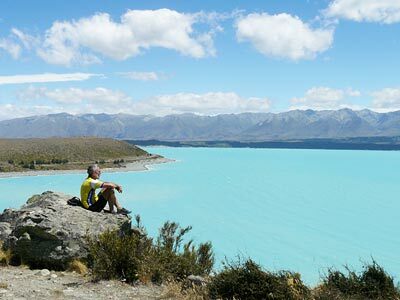 But it was worth it  the view of Lake Pukaki, when we finally got there, was stunning. Mt. Cook would have appeared in the center of this picture had it not been obscured by clouds. 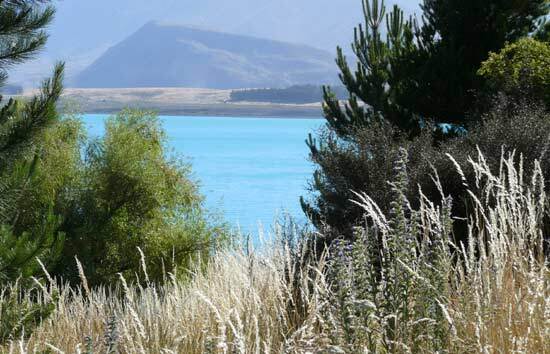 When we got to Lake Pukaki, we picnicked at the site on the right. 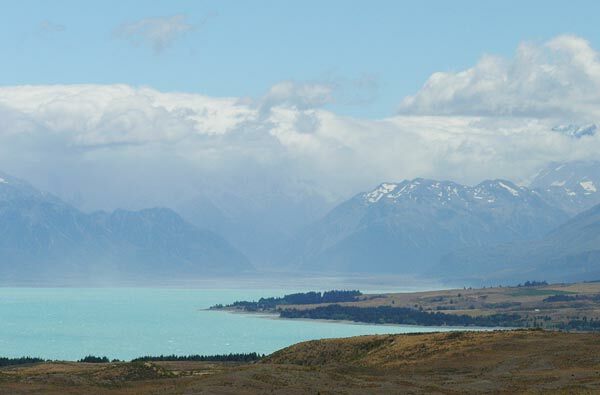 We then intended to turn north toward Mount Cook. However, that would have put us into the face of the terrible winds, so we kept going more or less south, with tailwinds much of the time. 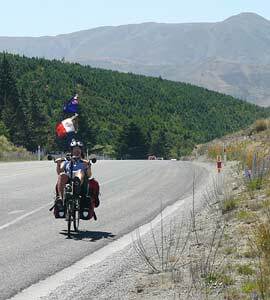 We almost stopped in Twizel, where we briefly chatted with a group of Australian cyclists, but finally decided to push on to Omarama. It was 85 kilometers altogether, some of it among the the most difficult cycling we've done (due to the strong north westerlies), some of it  when the wind was behind us  among the easiest. We had hoped to stay just outside Omarama at a sheep station that takes in guests, but there was a "no vacancy" sign on the gate. That seemed unlikely since there aren't very many tourists around, but a few hundred meters farther down the road, we saw the farmer at work with his dogs. It's shearing time, we think, and that may be why no guests were accepted. Disappointed, we continued to the overpriced campground at Omarama, from which we are sending this page.